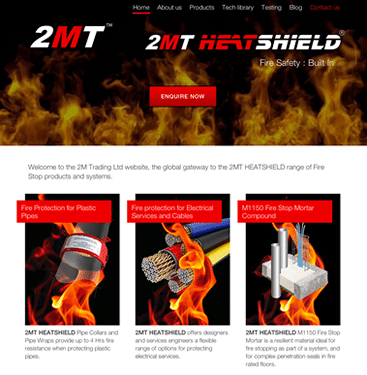 2M Trading are a new entrant into the Fire Stop Product sector, based in Aberdeenshire and helmed by two brothers with considerable past experience in the same sector. Gary approached us with some product info sheets and a few ideas about website content and we set about creating a number of website design options based on the existing brand. By working closely together we were able to quickly finalise a design that 2MT loved. It’s notoriously difficult to represent fire using a static image – most photos don’t do justice to it – so we used a video background of fire to give site visitors a more realistic and memorable impression. The existing promotional material was utilised for the basis of the site, and a password protected area was included so business partners and existing customers can access up-to-date technical data and certification documents when they require them.